Mitsubishi has been a leader in Direct-to-Plate technology for more than 30 years. The Direct-to-Plate process eliminates conventional intermediate steps such as film imaging and processing, stripping and plate burning, saving time, labor and equipment expenses. Mitsubishi's SilverMaster® plate materials were introduced into North America in 1975 and have been the industry standard ever since. SilverMaster® plate materials are Direct-to-Plate analog materials for production of first-generation printing plate directly from paste-up boards, eliminating the costly steps of conventional plate making. SilverMaster® is compatible with most camera platemakers in use today and available in paper and polyester bases for up to 25,000 impressions. 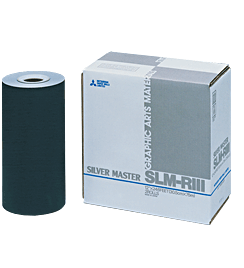 SLM-RIII - Paper-base plate materials for use in most camera platesetters and ideal for run lengths up to 10,000 impressions. SLM-FIII and SLM-FIII 100 - Polyester-base plate materials for use in most camera platesetters and ideal for run lengths up to 25,000 impressions. Mitsubishi SilverMaster® plate materials have been the industry standard in Direct-to-Plate technology for more than 30 years. The Direct-to-Plate process eliminates conventional intermediate steps such as processing, stripping and plate burning, and saves the time, labor and equipment expense of conventional platemaking. Create first generation printing plates directly from paste-up boards using a Mitsubishi or other camera platesetter and SilverMaster® plate materials and increase your shop’s efficiency and productivity.